When the money exploded and turned baseball into an oligarchy, the sport's have-nots came to a realization: It would take a staggering level of mismanagement by the game's overlords for them ever to compete consistently again. And when that day came – when the New York Yankees or New York Mets or Boston Red Sox or, better yet, all three – bungled their advantage, every team with the wherewithal would strike and strike fast. Then the Mets went shady and stopped competing. And the Red Sox turned dysfunctional and stopped pitching. Now the Yankees got decrepit and stopped spending. So here we are, nine days before Christmas, and the rash of moves outside the Northeast corridor to improve teams continues on – and with the Mets, the most pathetic of the three kings thanks to an owner who has no business still owning a team, doing the selling no less. 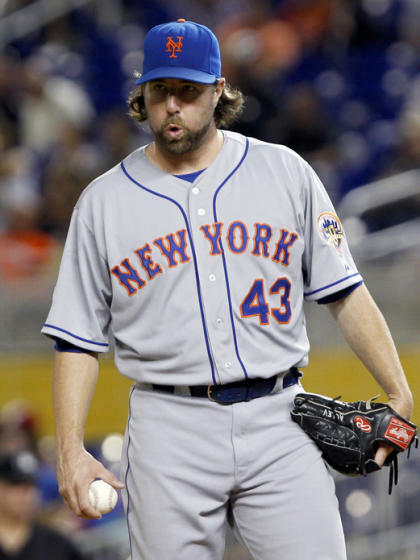 There is a reason the Toronto Blue Jays took the bold step to trade the best catching prospect in baseball, Travis d'Arnaud, to the Mets for National League Cy Young winner R.A. Dickey in a seven-player blockbuster consummated Sunday after weeks of will-he-or-won't-he-go blather. Of course he was going – and that will become official if Dickey, as expected, signs a contract extension within the next 72 hours. Everybody in baseball knew Zack Greinke was trying to beat CC Sabathia's record for average annual value in a multiyear deal, and when he did – when a pitcher with great peripherals, yes, and superb stuff, sure, but an ERA only 6 percent better than the league average over the last three years got his $147 million for six seasons – nobody was happier than the Mets. Because R.A. Dickey was going somewhere, and the price was on the move, and the price was going to be high. The Blue Jays, like the Angels before them with the Josh Hamilton signing, like the Tigers before them with the Anibal Sanchez signing, like the Reds before them with the Shin-Soo Choo trade, like the Royals before them with the James Shields trade, like the other teams (Atlanta, San Francisco) that have girded themselves this winter, see the vulnerability of the superpowers in New York and Boston and know that now is as good a time as any to take a crack at a championship run. To give up not only d'Arnaud but also Noah Syndergaard – one scout compared him in both size and stuff to two other big pitchers developed in the Blue Jays system: Roy Halladay and Chris Carpenter – meant Toronto was saying, unequivocally, we are going to win, even if it means mortgaging the future that looked far brighter before its two big deals this offseason. "Now is the time," one NL executive said Saturday night. "It's only three teams. I understand that. But when they're at their best, they run the free-agent market, they run the trade market, they run everything. Look at the Dodgers. They were awful under [previous owner Frank] McCourt. Their payroll was under $100 million. Now they're at $230 million and they're bullying everyone." The rush of aggressiveness, the display of hyper-competitiveness, the embrace of the risk that heretofore was the domain of the sport's elite – everything is a secondary effect of how weakened the three traditional powerhouses are. The Yankees, handcuffed by the desire to dip beneath the $189 million luxury-tax threshold next season, have signed five free agents this offseason. Four of them received one-year deals. The other got two years. Their average age is 36.4. Perhaps the Yankees were attracted to them because they could supplement their salaries with Social Security benefits. Either way, none will be around when the Yankees move into the middle of the decade with a mediocre core, bloated payroll, middling farm system and legitimate competition from Toronto, Tampa Bay, Baltimore and Boston. At least the Red Sox have a farm system of which to speak. They're going to need it. If Mike Napoli's contract goes through, they'll have spent nearly $150 million on free agents this offseason and improved … some? A little? Their clubhouse certainly will be more jovial, but their attempts at forcing good chemistry through good-guy poaching is counterintuitive. Real chemistry is organic, usually the product of winning; this is no chicken-or-egg debate. Napoli and Shane Victorino and Ryan Dempster and Jonny Gomes aren't going to turn a 93-loss team into a championship contender. The Red Sox, baseball's best run franchise during the first decade of this millennium, no longer inspire fear. Which, of course, is better than inspiring laughter. The Mets are not some snakebitten franchise deserving of pity. Their owners worked with the artist of a Ponzi scheme and got ensnared in the fallout. Contracts turned bad and the team wretched as it moved into a new ballpark. Fans stopped coming because who wants to watch futility. Cash flow dried up, the team got worse and now it's trading the Cy Young winner because he wanted $26 million for the next two years and they were willing to give him only $20 million, which even the word insulting thinks is insulting. As we've learned, payroll does not always equal a winner. It does equal greater opportunity to live through mistakes. And since the strike ended in 1995, no teams have spent like the Yankees, Red Sox and Mets. The dawn of the major market was actually closer to 1998. In '95, the Red Sox were 21st in spending and the Mets 26th. They moved into single digits in 1998 and from thereon, for the next dozen years, Boston never finished lower than fifth in payroll and the Mets sixth. Two years, the Yankees, Red Sox and Mets were 1-2-3. Two more years, the Yankees, Mets and Red Sox were 1-2-4. The three were like a luggage lock, a trio of single-digit numbers representative of their collective heft. No wonder, then, teams feel like now is a particularly ripe time to make a run. Not only could the Yankees, Red Sox and Mets enter the 2013 season with the playoffs a troublesome endeavor, it's not like 2014 is looking all that bountiful for any of them, either. Two years in baseball is an eternity, and if it means overpaying for someone – or, in the Dodgers' case, overpaying for everyone – so be it. Try as it may to migrate the center of the baseball universe to Los Angeles, the Dodgers and Angels understand the natural order shifts it back to the Northeast eventually. This is just an ice age. For teams like the Blue Jays and Royals, the window could be short, and so they strike. Toronto general manager Alex Anthopoulos pulled off the 12-player blockbuster with the Marlins to start the Blue Jays' run and went a step further with Dickey. He didn't want to improve. He wanted to win. The Royals didn't want to get to .500 by nabbing Shields at the cost of Wil Myers, the game's best hitting prospect. They wanted to nip at the Tigers, who responded with an $80 million commitment to Sanchez. One move begets another, each team angling to take advantage not only of the powerhouse's problems but also of the playoff expansion that gives more teams hope for a postseason lottery ticket. By now, we know that's all it takes. The best team doesn't win. The hottest team does. That can be anybody, though it's a lot easier when the teams that usually spend $150 million-plus are either broke, retooling or cutting back. Certainly there are plenty of reasons for the outsiders to strike now. The Dodgers and Angels will continue doing so, and maybe the Tigers, too, because they have the sort of owner every fan wishes for: a rich, old guy who just wants to see a championship. The teams ready to win now have proven willing to do everything they can to do so. And the ones on the outside will stare through that window and curse their luck. The baseball world is upside down. It's time to eat the rich. And the dinner bell rings louder every day.